Land(ing) in all kinds of trouble. "Um...are you busy?" "I'm working, why?" "Um, cos we need you to come over the river and rescue us..."
Now that you are suitably amused by the dulcet tones of Bing Crosby it's time for a little lesson in pig enclosures. The first thing to know about pigs is that they make Harry Houdini look like a man with three thumbs, pigs are the real escape artists and unless you make your fields pig proof you are likely to lose a few, or worse, all of them. 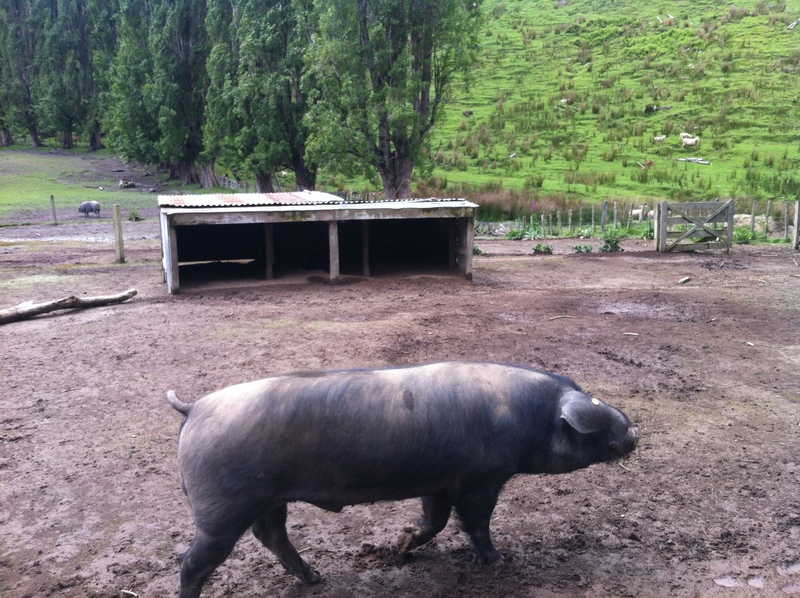 A couple up the road who make apple cider vinegar (more later about them) lost a pet Kune Kune to an incident with a neighbours market garden and a shotgun, another reason to ensure they don't get out. Last monday myself and my trusty advisor Reuben (more about him later too) started work on the fencing. Initially I was hoping to get away with using electric fencing tape to mark out the individual paddocks in the field but apparently that would just end up as a ball of fencing tape tied to a pig as he happily trotted across the to the neighbours. The fear I had was having to dig tens of deep post holes into some of the rockiest ground in NZ , an ancient river bed covers the whole farm, but the answer was the simple metal waratah. 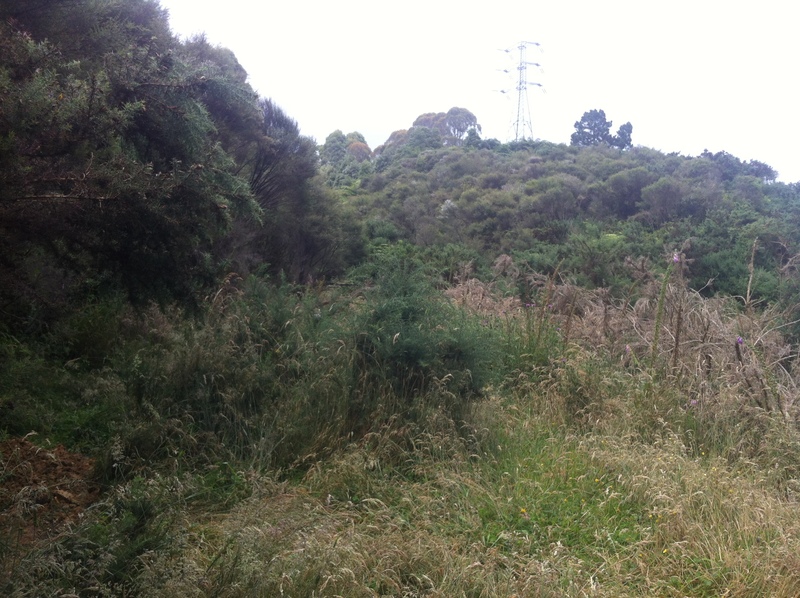 [caption id="attachment_171" align="aligncenter" width="224"] A line of steel waratahs. [/caption] Metal waratahs are Y shaped fence posts that you hammer into the ground about every 6 meters. Sounds easy but trying to get these things straight and facing the right direction whilst aiming to miss the football sized rocks proved a complete challenge. Add to this the unbelievable noise of metal on metal as you hammer down the post and you are in for a night of aches and pains and ringing ears. Twenty waratahs later and we had the outline of paddock number one and time for the wire. After much careful placement and confused looks the poles were in and it was time to learn the skillful art of bending, twisting, threading and cutting high tensile fence wire. I have seen many farmers and workers on TV tieing fences and they make it seem like the wire is as flexible as string, the reality is that unless you are Uri Gellar metal actually doesn't want to bend and especially doesn't want to be tied to a post. Just as we were finding pliers to tie the difficult bits and pulling bits of wire out of our exposed skin a friendly local farmer popped around to say hello. Andrew Martin lives up the road and his family were one of the founding families of the area, festooned in his farming overals and 'cowboy' style hat he drove one of the largest tractors I have ever seen all the way through the farm to the back paddock where the pigs will be kept. Stopping for a chat he saw the mess of the wire we were making and offered to show us a tip or two. 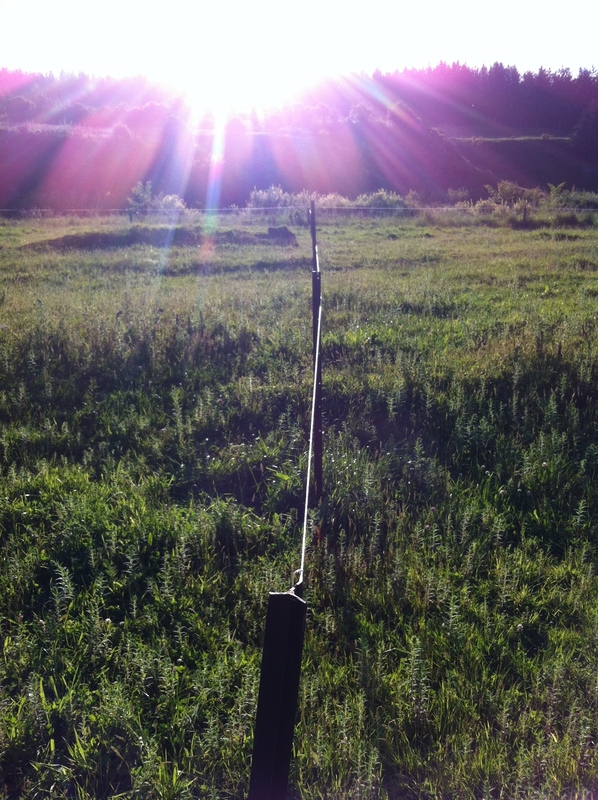 Without further ado he grabbed a piece of wire, fashioned it into a handle, twisted a perfect knot and snapped (yes, snapped) the end off the wire, it was a piece of farming art. 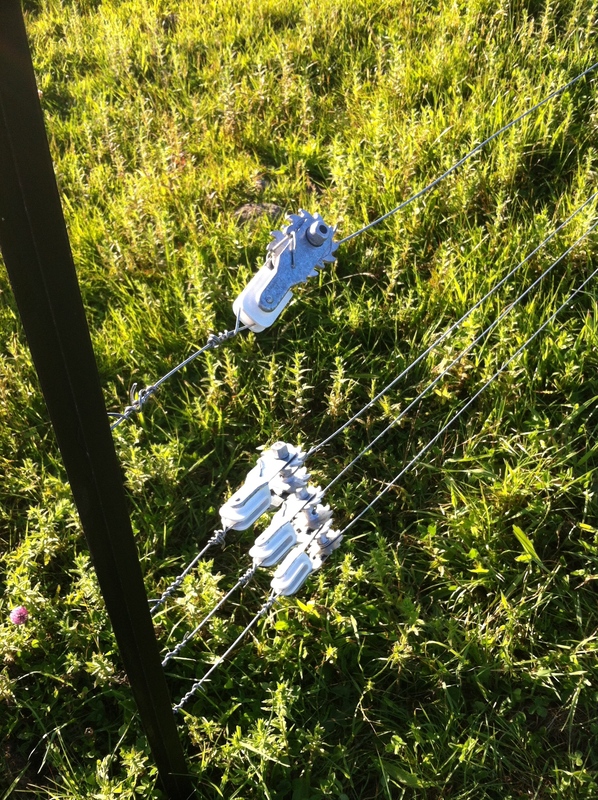 [caption id="attachment_177" align="aligncenter" width="224"] The high tensile wire is connected to the waratah via an insulator, this stops the electric fence from being earthed. [/caption] I am pleased to say that I can now tell you that the fencing for paddock number 1 (River Field #3) has been completed and the place is really taking shape in time for the arrival of the nine large black pigs due to be delivered in two weeks time. 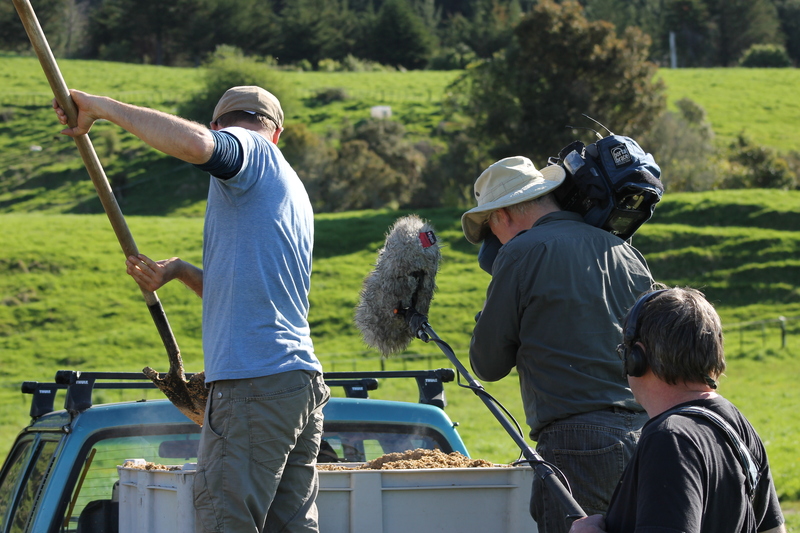 It never ceases to amaze me all the things I am learning and the amount of improvisation that farming is. In addition to the fences this week I have built a gate from scratch, plumbed in 200m of plastic piping and a push button drinking fountain, run out of petrol, hit my foot with a pick axe and driven over my UHF radio. 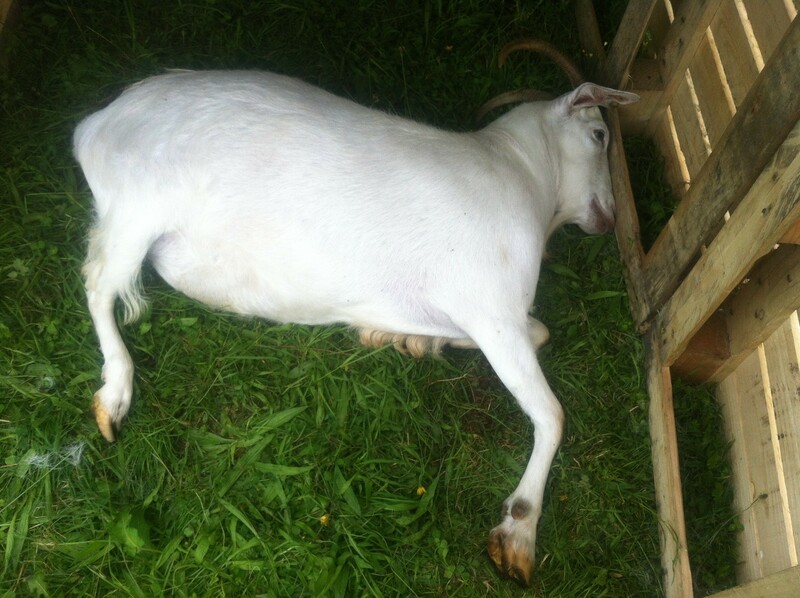 Which neatly brings me to this weeks Farm School Detention. This week is all about remembering where you put things. Having spent 30 mins searching for some tools in the paddock grass, which is up to my hip, I proceeded to reverse the Land Rover over my two week old UHF radio, which I had taken out my pocket and placed (carefully) on the bonnet of the car. When you live in an appartment its not a major issue that you lost the remote down the back of the sofa or placed the keys in the fridge, when you are working in a 5 acre field its easy to lose almost anything in the grass, even the Land Rover. 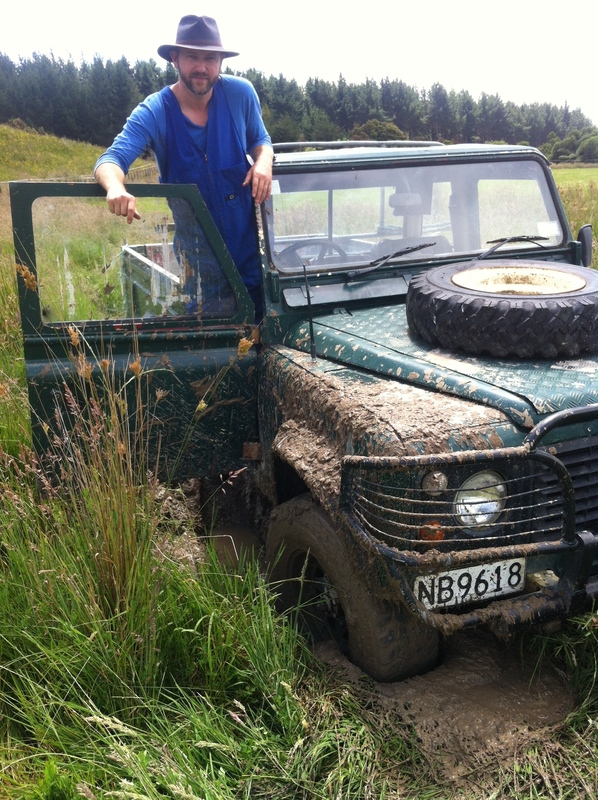 Finally for those who follow the trials and tribulations of the Land Rover, this week she was taken to the 'doctors.' After I ran out of petrol on the farm (the gauge is not working) she started to paint the floor black with the exhaust fumes so I bit the bullet and drove ten minutes up the road (at no more than 70kph) to the mechanics, it was one of the scariest things I have ever done and Claire, who was following in the Holden, tells me the fumes were reminiscent of Apocalypse Now. Turns out one of the rear brake cylinders was seized and the two front calipers were worn out. She is due back mid next week and then I am going to work on the door latches so I don't have to wind the window down every time I want to get out the car....don't ask. 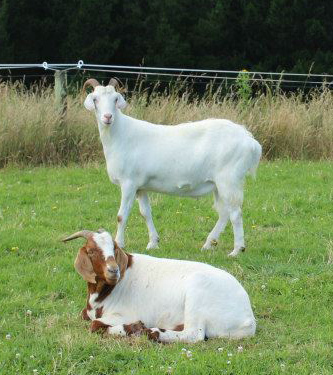 On Friday the 1st November Claire and I moved onto the farm on North Manakau road. 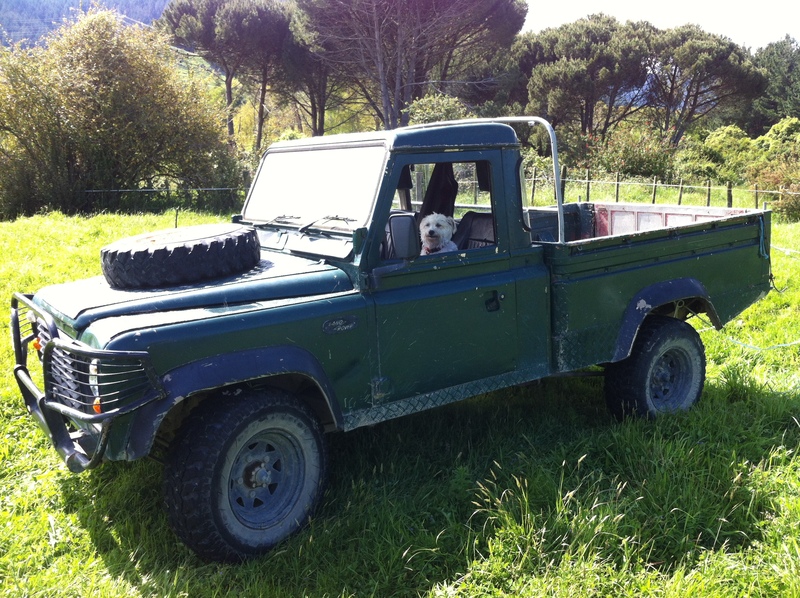 Since then it has been a complete blur of moving in, getting settled, meeting people, buying screws, poles and washing machines and touring the farm in our newly inherited 1987 Land Rover 110. [caption id="attachment_121" align="aligncenter" width="890"] Woody pretends to drive the Land Rover, he hasn't worked out the steering wheel is on the other side. [/caption] Already the house is looking and feeling great and Claire has taken to being a domestic goddess like a duck to water but there is work to be done on the farm, lots of it. I have given myself the goal of making an income from the livestock by February 2014 and this means the grower pigs need to be six months old by then, simple maths will tell you that I need to buy the two month old weaners right now. So the search for the pigs has already began. 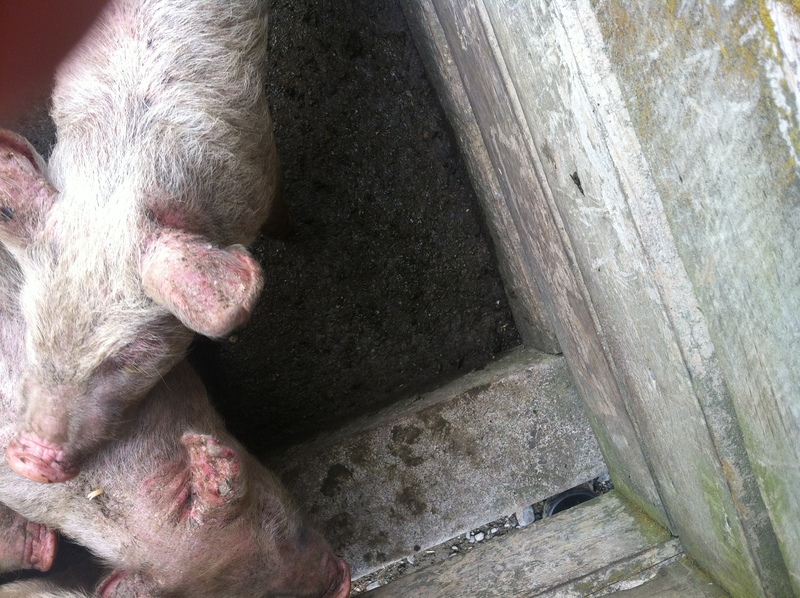 [caption id="attachment_123" align="alignleft" width="300"] Pigs in the saleyards at Rongatoa, check out the sunburn on those ears. 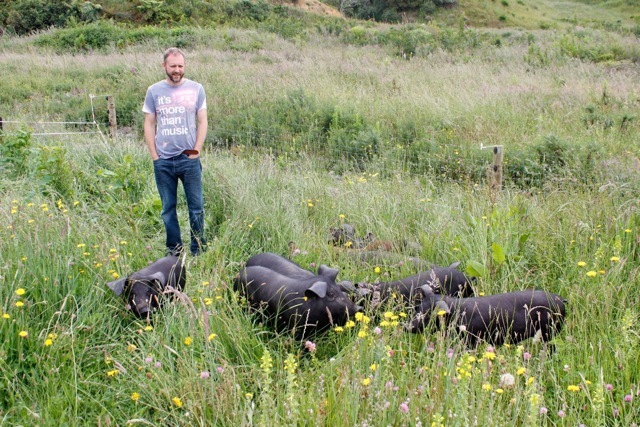 [/caption] [caption id="attachment_124" align="alignright" width="300"] True free range Large Black (Devon) pigs on a small farm just outside Wanganui[/caption] [caption id="attachment_140" align="aligncenter" width="224"] The livestock auction at Rongotea. 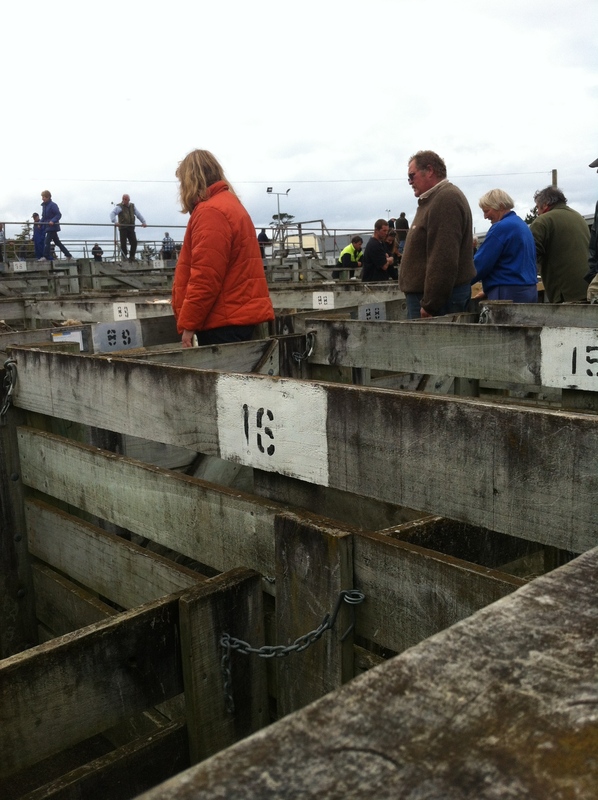 [/caption] Three days ago I went to my first livestock sale yard and auction in a small rural town called Rongatoa, about an hour north of the farm. 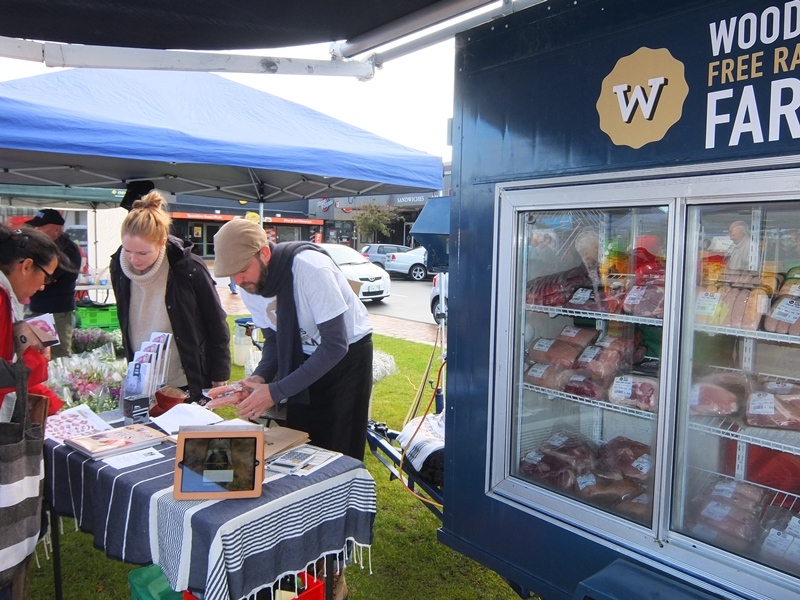 As with most farming in New Zealand and Australia the focus is mostly on cattle and sheep but they had a few pigs up for sale, set well away from the rest of the stock and looking very forlorn. Now I don't know much about pigs, yet, but I can tell you that these pigs didn't look happy, there were 5 white pigs (presumedly from a larger litter) and if you look at their ears in the photo I took (above left) you will see they are quite badly sunburnt and overall looked scrawny and dirty, they sold for $101 a piece. In contrast, today I drove over 200km to visit a true free range farm just north of Wanganui where I met the very gracious Gill and her husband. Whilst scoffing two homemade savoury scones, washed down with a good ole cup of tea we discussed the pitfalls and merits of pig farming. 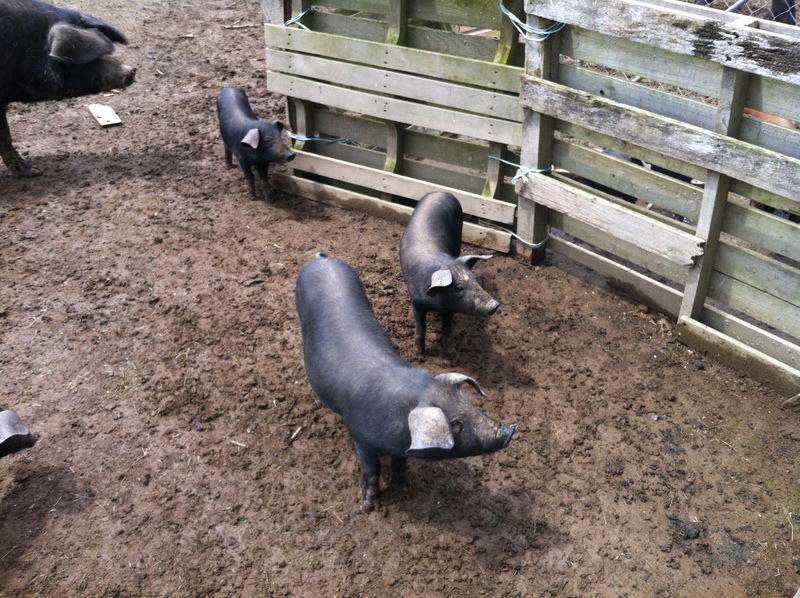 After this we went for the obligatory farm tour to see all the pigs, the boar, the sows and the piglets. [caption id="attachment_135" align="aligncenter" width="890"] This is Jack the Large Black (Devon) Boar, the big Daddy at over 300kg. [/caption] They all looked very happy and enjoyed the freedom of walking around the whole paddock. The 9 piglets they had for sale were all 100% Large Blacks (Devon) piglets and generally seemed in good shape, five sows and four boars. So I bought them all for $75 each and they will arrive in the first week of December, just in time for me to have completed the work on the farm. So the pigs are coming but I don't have fencing, water troughs or feed set up. I have chosen the best paddock to start off the pig project but I need to get it prepared and only have three weeks to do it. I will be installing electric fencing (the property is already electrified so I just need to structure the fence lines), dropping a water line from the high paddocks on the other side of the fence and buying an auto feeder. All in a days/weeks work.